HUUB wetsuits are only entering their second year but they're already taking the swimming and triathlon world by storm, and now the elite athletes are joining the party. HUUB are very proud to announce today that Alistair and Jonny Brownlee (Gold and Bronze medal winners at London 2012) have chosen HUUB as their wetsuits of choice. Alistair said: "Since I started Triathlon, I have always known that you have to have a top wetsuit. I choose HUUB because they spend a lot of time researching how to help make me faster in the water. The new suit feels great and I'm looking forward to racing in it this year. It's just a shame they've given Jonny one as well!" Swim Smooth are co-designers of the range and it's a very proud day for us that two of the greatest triathletes of all time have chosen HUUB. We can't wait to see the swim splits this phenomenal pairing can pump out in these super-fast suits! Follow today's announcements on HUUB twitter feed and facebook page. For all our frustrated US readers we have some great news, we're planning a trip to the US in June this year. Paul Newsome and Adam Young will be kicking off in New York after Paul takes on the mighty 46km Manhattan Island swim - let's hope he's got some energy left to coach afterwards! More details of the tour to follow soon. Kicking off a week today, Swim Smooth will be at the Triathlon Show (formerly TCR) at Sandown Park, London. Paul is flying in from Australia and will be joined by Adam Young and many of the other Swim Smooth Coaches from around the UK. We're sharing a stand with HUUB wetsuits - come and say hi and bring a video clip of your stroke along on a pen drive and we'll give you an analysis of your stroke to take away. Of course, we'll also have all our DVDs, training plans and the new Swim Smooth book for you to check out on the stand. analyse your stroke live at the show! Make sure you try on one of the fantastic HUUB wetsuits and discover why Alistair and Jonny chose HUUB over any other wetsuit on the market. Featuring our unique HD footage of elite swimmers, Swim Smooth take a close look at why great swimmers and triathletes are so quick and how to make the same changes in your own stroke. Worried about open water swimming or struggling to transfer your pool performances across to the open water? We take a close look at why that is and how to get much much better at it. Includes new footage from our elite group in Perth showing you how it's done and sometimes getting it wrong themselves! Both of our seminars played to packed auditoriums last year so get there early to get a seat. The correct answer is C, the fastest of the three. This is 75 strokes per minute (SPM) and if you own a Tempo Trainer Pro and have tried to swim at this rhythm yourself then you'll know it's a very fast stroke rate. Far too quick for there to be any pause-and-glide in his stroke. Many swimmers remember Thorpie as having a long slow technique but this is an illusion brought about by the length of his stroke and his silky smooth movements. In fact he has a long and fast stroke, which is why he is so devastatingly quick of course! I've got it down to 24 per lap, which is about as low as I want it to get. I could reduce it by another four strokes but the danger is that I'd get to the point where I'm gliding rather than swimming efficiently. Ian's talking about deliberately taking fewer strokes per lap during a technique set but the interesting point here is that when swimming in a race he actually took 30-32 strokes per 50m. A full 10-12 strokes more than he could if he wanted to. Further, by studying slow motion video of Ian swimming we can see that any perceived glide in his stroke is an illusion. The gap between one of his strokes finishing at the rear and the next starting at the front is just 0.15 to 0.2 of a second - less than the blink of an eye! This highlights the fact that while Ian developed a brilliantly efficient freestyle stroke, he didn't do so by making his stroke as long as he possibly could. Instead, he found the right trade off between the stroke length and stroke rate given his height, build, flexibility and fitness level. And you should do the same. Many swimmers have been taught to add a deliberate pause-and-glide in their strokes but this is something we fundamentally disagree with here at Swim Smooth, even for novice swimmers. As Ian said, by trying to artificially elongate your stroke you'll experience a big drop-off in your efficiency and once ingrained the pause-and-glide habit is a very hard one to break. The classic Overglider strokes very slowly indeed, in the region of 45 SPM (listen to that here). If you visualise swimming at that stroke rate you can appreciate how you would start to sink low in the water and lose any sense of rhythm. If you're an Overglider yourself and have tried to lift your stroke rate then you might have found it hard to do. What's normally happening here is that you're keeping the deadspot in place and trying to increase the speed of every other movement! Instead, lift your stroke rate by removing the pause. Keep things smooth and continuous at the front of your stroke, either extending forwards, catching the water or pressing backwards, never pausing. Should You Be Doing More Of That Drill You Hate? You've probably got a favourite swimming drill, it feels natural and smooth to perform and you identify with the reason for doing it. But equally we all have drills that we dislike that feel awkward and difficult, drills that some other swimmers can perform with ease but never click for us. Whenever you have this experience don't see it as a negative thing, look on it as a positive. All that is happening is that the drill is highlighting a weak area of your stroke technique and something you need to work on. If you struggle to sink while exhaling then you're definitely someone who likes to hold their breath underwater. Learning to let go of the air in a smooth relaxed way is key to ridding your system of CO2 as you swim and helps bring your legs up higher behind you. Work on relaxing and letting go of the air to help you sink, it may surprise you just how much air is in there! The most common reason for disliking this drill is if you have poor posture, with your lead arm crossing the centre line in front of your head as you swim. Think about drawing your shoulder blades together and back during the drill to bring that lead arm straight and so become much more comfortable on your side. This improved posture also helps develop better rotation in the stroke. Swimmers who drop their lead arm when breathing (Bambinos) may also find this drill difficult. As you rotate your head to the side to breathe during the drill, focus on keeping the lead arm held in front of you to give you support. Don't let it collapse downwards. Sculling requires "feel for the water", meaning your ability to connect with the water at the front of the stroke. To improve your sculling make sure your elbow is higher than your wrist, and your wrist is higher than your fingertips as you perform the drill (the hands may feel lower in the water than you expect to achieve that). Move your hands in and out, angled so that you feel the water's pressure on your palm at all times - it's a bit like mixing hot and cold water in the bath! See sculling in action here. If you have poor rotation in the stroke you will find Doggy Paddle difficult, or just as commonly you could be pressing down on the water in front of your head with a straight arm. As you perform the drill think about "reaching and rolling", rotating your hips on every stroke and pulling through underwater to around your belly button. Also work on bending your elbow in front of your head so that you can press the water backwards (with your hand facing the wall behind you) instead of downwards. Keep that lead hand constantly in motion either extending, catching the water or pressing backwards. As in your full freestyle the movements should be smooth and fluid - never pausing! This is quite a tricky drill that is all about developing your rhythm and timing. If you have any dead-spots or pauses in the stroke this drill will feel very difficult, as it will if you press the water downwards with a straight arm during the catch. Try working on improving your Doggy Paddle and then return to Unco to feel the improvement. More information on the Unco drill is here. Another advanced level drill that highlights any weaknesses in your rhythm and timing. If you struggle with waterpolo remember it's a high-effort exercise (nearly sprinting!) and you need to keep a really strong rhythm going. Less advanced swimmer can use a larger pull-buoy during the drill focusing on maintaining a strong tempo, getting into the stroke quickly at the front. The irony here is that it is the drills we find hard that we need to persist with and work on improving. The drills you find easy and enjoy are useful for stroke maintenance but not so important to move you forwards. Studies into swimming injury show that 80% of us suffer from enough shoulder pain at some point during our swimming lives to keep us out of the water for at least a few days. In the past swimmers and coaches thought that some level of shoulder pain or even injury was normal in swimming and something that just had to be lived with. Fortunately with a modern understanding of bio-mechanics we now know that's not the case, with a good stroke technique any swimmer should be able to remain pain and injury free even when training very hard. Instead of entering thumb first, enter fingertips first with the hand facing downwards, this keeps the shoulder neutral and sets you up perfectly for a great catch and pull through to follow. 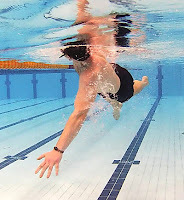 A crossover combined with a thumb first hand entry is particularly stressful for the shoulder and a full injury surely lies in wait for any swimmer doing this. This can feel deceptively like a good catch because of the feeling of water pressure on the palm of the hand but unfortunately it only lifts you up at the front and sinks your legs downwards. It also places a large stress on your shoulder joint which can easily lead to pain and inflammation. Work on developing your catch so you press the water backwards, not downwards and expect this to feel a lot less forceful. A straight pull through places a lot of load on the shoulder joint. Pulling wide tends to cause internal pain while crossing under the body with the arm over-stretches the outside and rear of the shoulder. This can be quite hard to diagnose without video analysis but can be done by watching a swimmer carefully as they swim towards you at the end of the pool. Work on bending the elbow under the body bringing the hand directly under the shoulder, we call this 'Bending It Like Becky'. If you suffer from any level of shoulder pain or injury from swimming there's almost certainly a flaw in your stroke technique causing the problem and you need to take immediate action to correct your stroke technique. Once developed a full blown shoulder injury is extremely frustrating and can take a long time to overcome - prevention is far better than cure when it comes to looking after your shoulders.